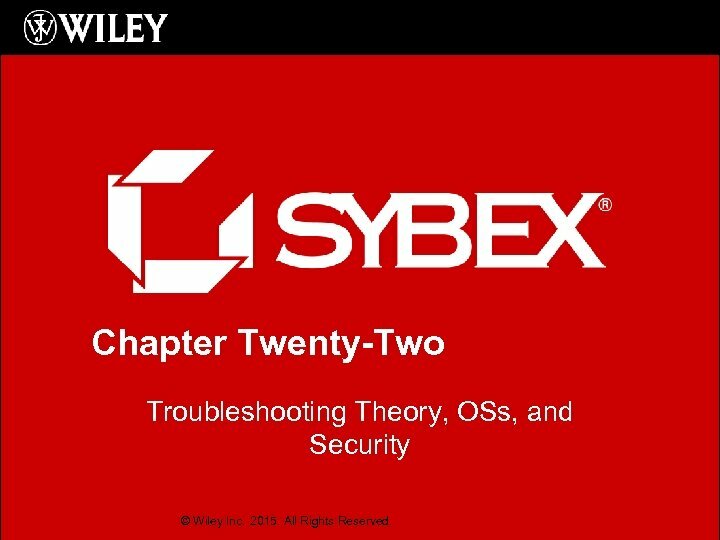 Chapter Twenty-Two Troubleshooting Theory, OSs, and Security © Wiley Inc. 2015. All Rights Reserved. 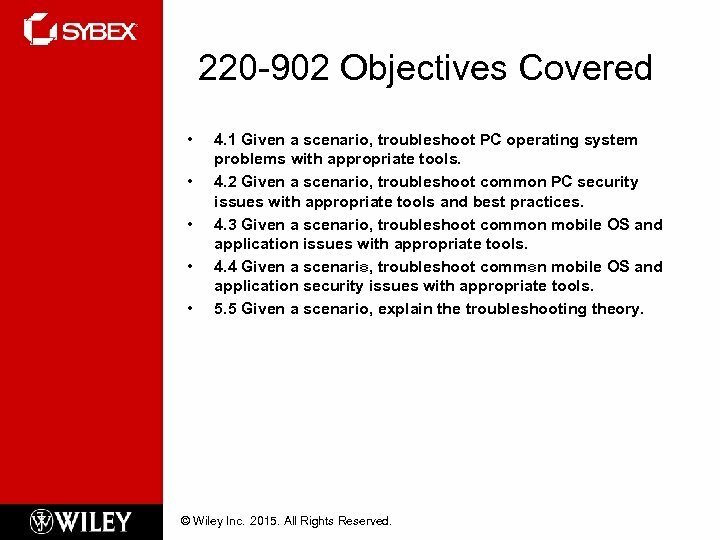 220 -902 Objectives Covered • • • 4. 1 Given a scenario, troubleshoot PC operating system problems with appropriate tools. 4. 2 Given a scenario, troubleshoot common PC security issues with appropriate tools and best practices. 4. 3 Given a scenario, troubleshoot common mobile OS and application issues with appropriate tools. 4. 4 Given a scenario, troubleshoot common mobile OS and application security issues with appropriate tools. 5. 5 Given a scenario, explain the troubleshooting theory. © Wiley Inc. 2015. All Rights Reserved. 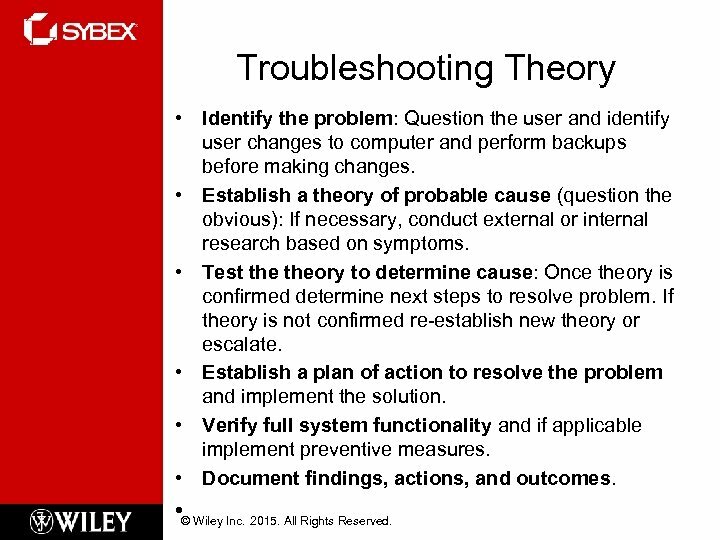 Troubleshooting Theory • Identify the problem: Question the user and identify user changes to computer and perform backups before making changes. • Establish a theory of probable cause (question the obvious): If necessary, conduct external or internal research based on symptoms. • Test theory to determine cause: Once theory is confirmed determine next steps to resolve problem. If theory is not confirmed re-establish new theory or escalate. • Establish a plan of action to resolve the problem and implement the solution. • Verify full system functionality and if applicable implement preventive measures. • Document findings, actions, and outcomes. • © Wiley Inc. 2015. All Rights Reserved. 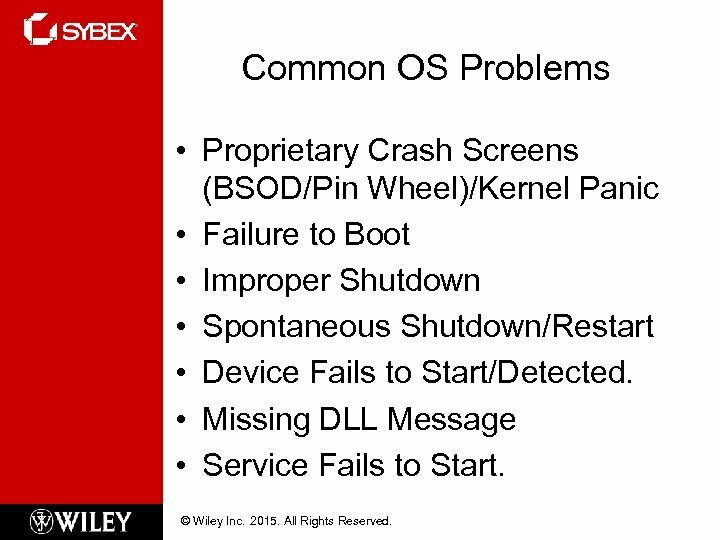 Common OS Problems • Proprietary Crash Screens (BSOD/Pin Wheel)/Kernel Panic • Failure to Boot • Improper Shutdown • Spontaneous Shutdown/Restart • Device Fails to Start/Detected. • Missing DLL Message • Service Fails to Start. © Wiley Inc. 2015. All Rights Reserved. Common OS Problems (cont. ) 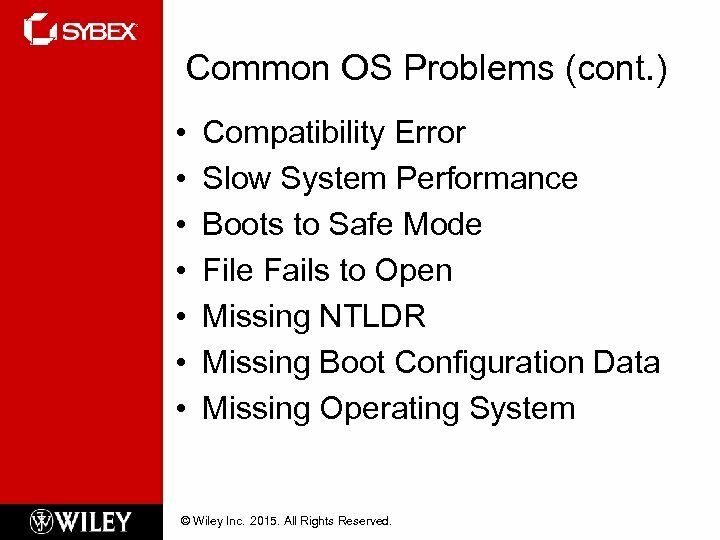 • • Compatibility Error Slow System Performance Boots to Safe Mode File Fails to Open Missing NTLDR Missing Boot Configuration Data Missing Operating System © Wiley Inc. 2015. All Rights Reserved. Common OS Problems (cont. ) 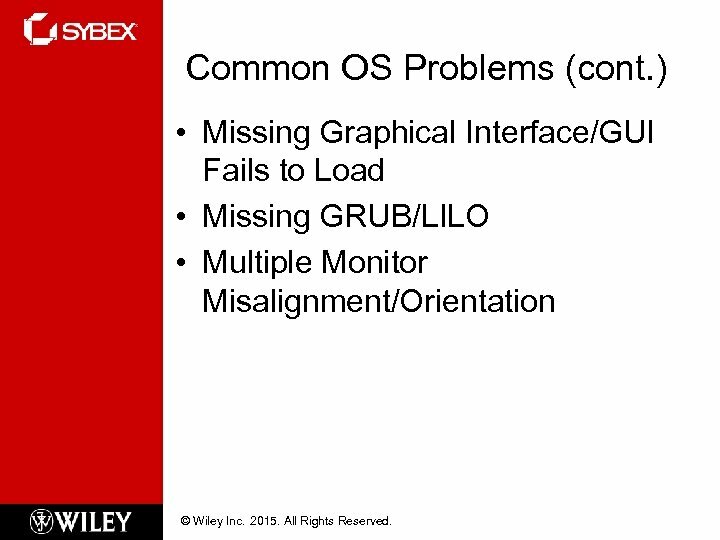 • Missing Graphical Interface/GUI Fails to Load • Missing GRUB/LILO • Multiple Monitor Misalignment/Orientation © Wiley Inc. 2015. All Rights Reserved. 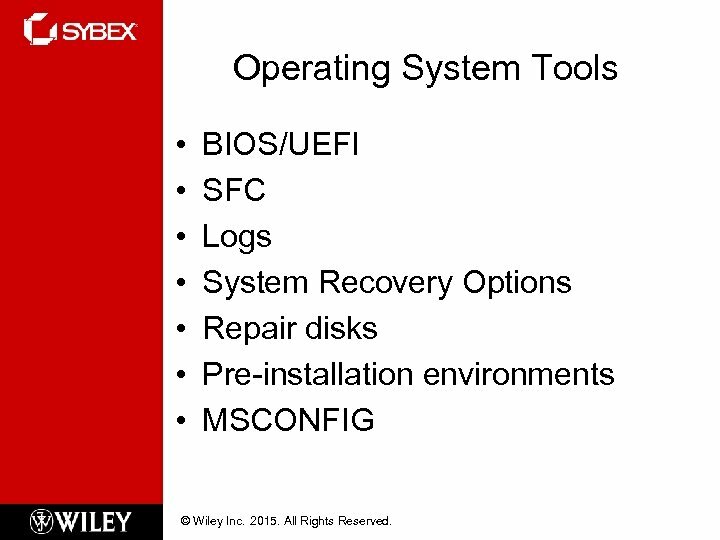 Operating System Tools • • BIOS/UEFI SFC Logs System Recovery Options Repair disks Pre-installation environments MSCONFIG © Wiley Inc. 2015. All Rights Reserved. Operating System Tools (cont. ) 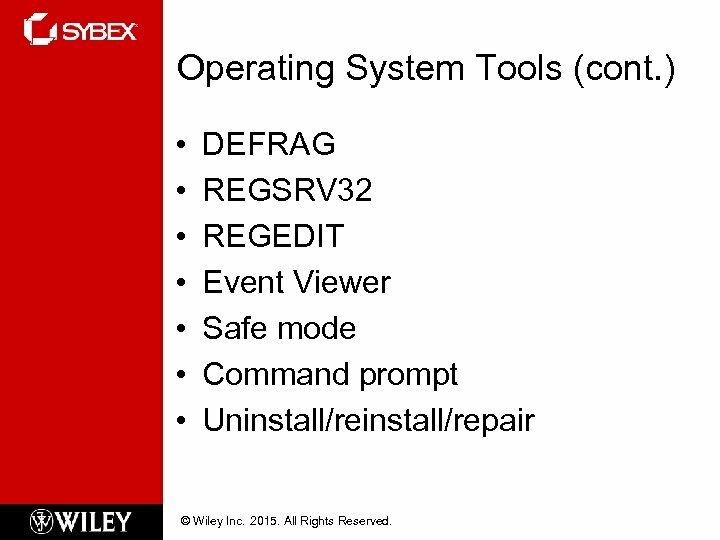 • • DEFRAG REGSRV 32 REGEDIT Event Viewer Safe mode Command prompt Uninstall/repair © Wiley Inc. 2015. All Rights Reserved. 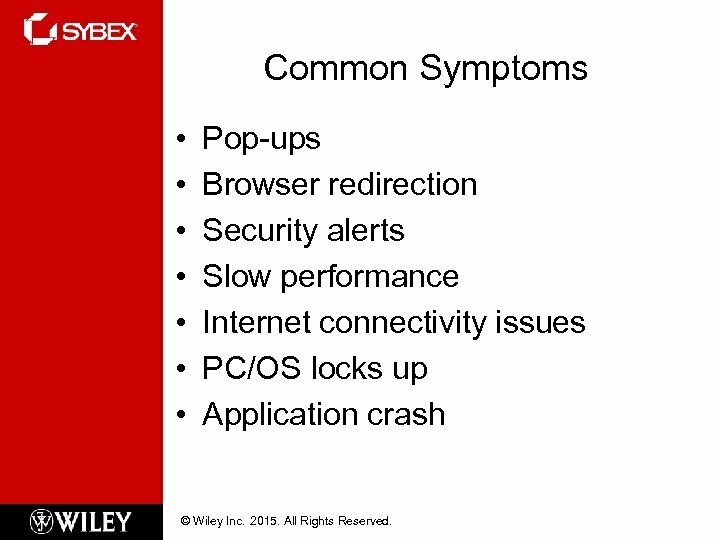 Common Symptoms • • Pop-ups Browser redirection Security alerts Slow performance Internet connectivity issues PC/OS locks up Application crash © Wiley Inc. 2015. All Rights Reserved. Common Symptoms (cont. ) 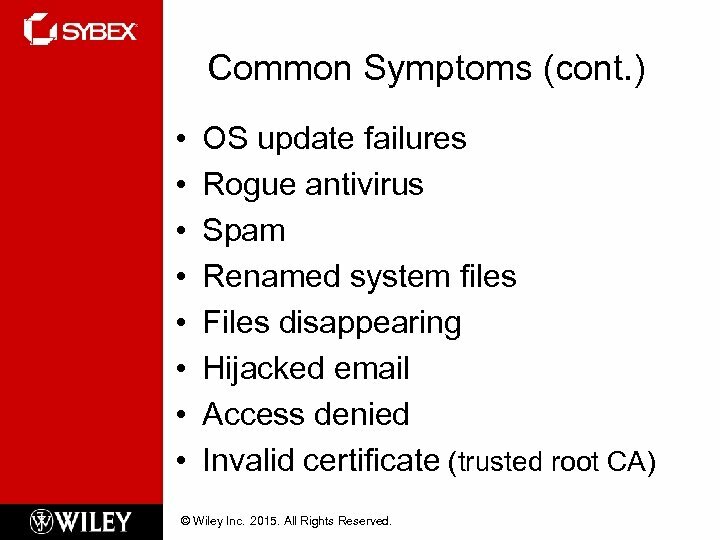 • • OS update failures Rogue antivirus Spam Renamed system files Files disappearing Hijacked email Access denied Invalid certificate (trusted root CA) © Wiley Inc. 2015. All Rights Reserved. 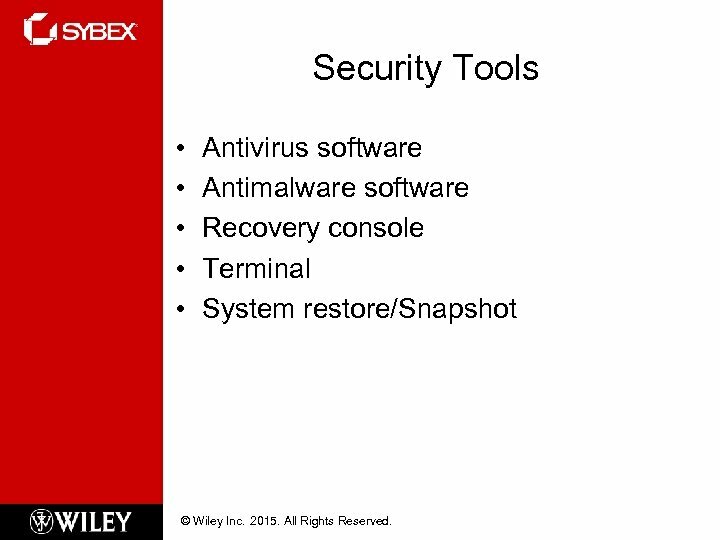 Security Tools • • • Antivirus software Antimalware software Recovery console Terminal System restore/Snapshot © Wiley Inc. 2015. All Rights Reserved. 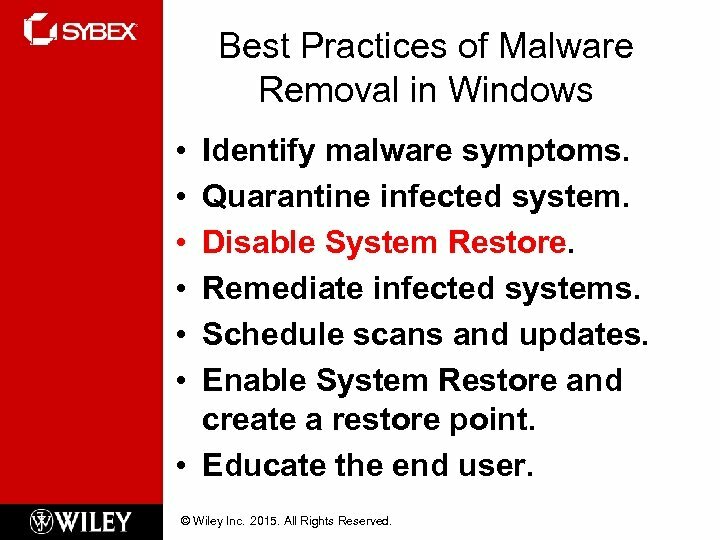 Best Practices of Malware Removal in Windows • • • Identify malware symptoms. Quarantine infected system. Disable System Restore. Remediate infected systems. Schedule scans and updates. Enable System Restore and create a restore point. • Educate the end user. © Wiley Inc. 2015. All Rights Reserved. 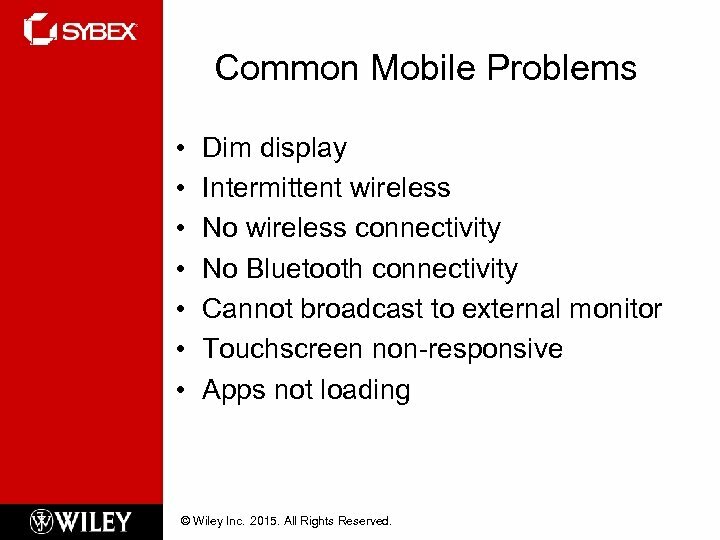 Common Mobile Problems • • Dim display Intermittent wireless No wireless connectivity No Bluetooth connectivity Cannot broadcast to external monitor Touchscreen non-responsive Apps not loading © Wiley Inc. 2015. All Rights Reserved. Common Mobile Problems (cont. ) • • Slow performance Unable to decrypt email Extremely short battery life Overheating Frozen system No sound from speakers Inaccurate touchscreen response System lockout © Wiley Inc. 2015. All Rights Reserved. 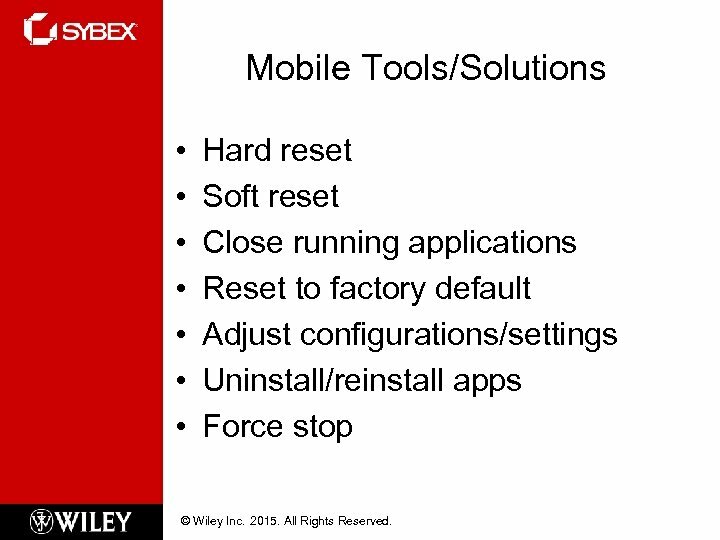 Mobile Tools/Solutions • • Hard reset Soft reset Close running applications Reset to factory default Adjust configurations/settings Uninstall/reinstall apps Force stop © Wiley Inc. 2015. All Rights Reserved. 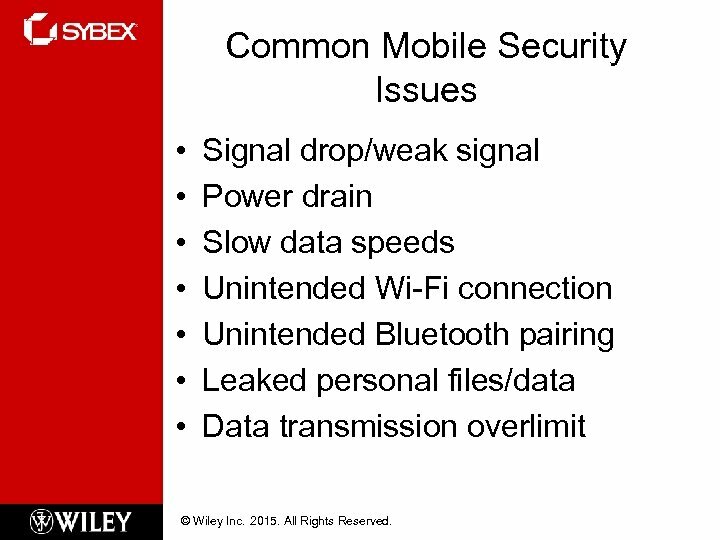 Common Mobile Security Issues • • Signal drop/weak signal Power drain Slow data speeds Unintended Wi-Fi connection Unintended Bluetooth pairing Leaked personal files/data Data transmission overlimit © Wiley Inc. 2015. All Rights Reserved. 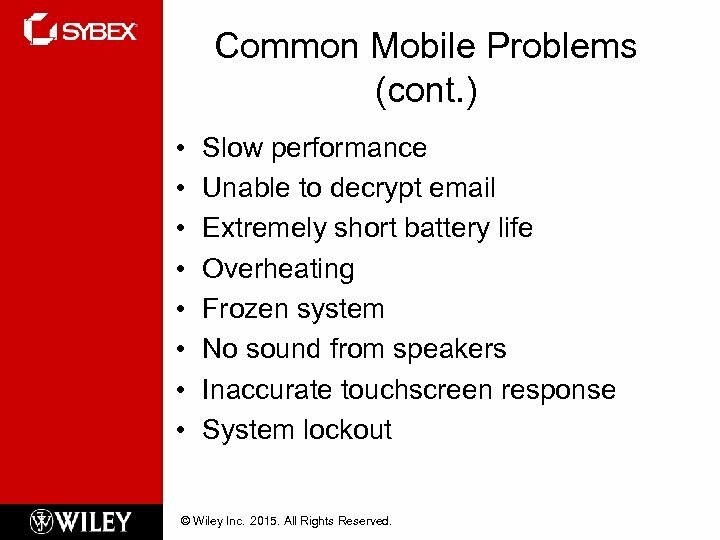 Common Mobile Security Issues (cont. ) 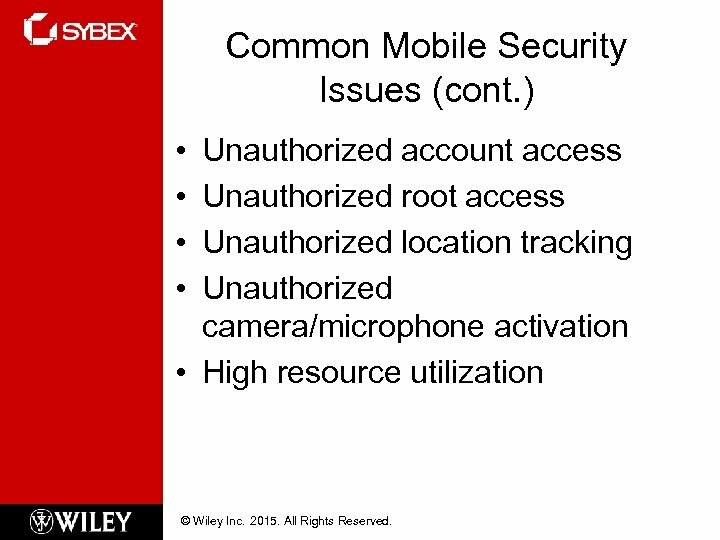 • • Unauthorized account access Unauthorized root access Unauthorized location tracking Unauthorized camera/microphone activation • High resource utilization © Wiley Inc. 2015. All Rights Reserved. 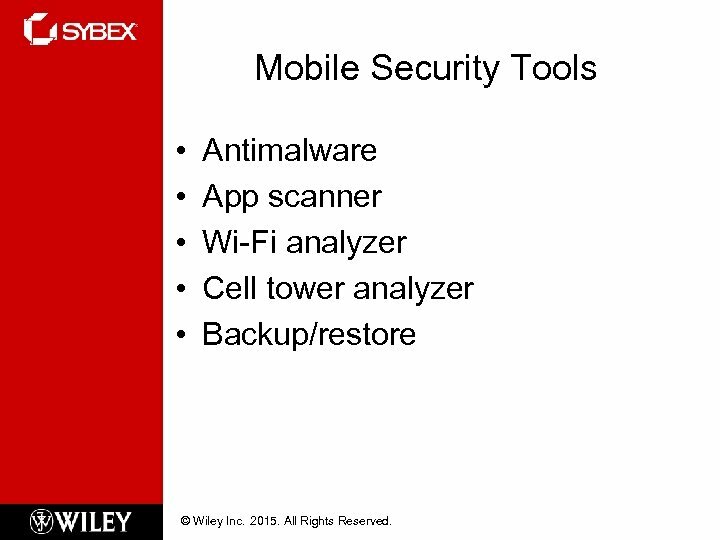 Mobile Security Tools • • • Antimalware App scanner Wi-Fi analyzer Cell tower analyzer Backup/restore © Wiley Inc. 2015. All Rights Reserved.